Crawford considers how to meld carfree planning with innovative designing methods to achieve carfree areas so irresistibly attractive that people will clamor for them. The book sets out to make city design accessible to everyone. This manual considers theoretical issues, urban planning processes, and a richly illustrated palette of the urban elements that make up a pleasing whole (streets, squares, gates, waterfronts, arcades, parks, courtyards).The earlier book, Carfree Cities, proposed a practical arrangement for carfree cities based on walking, bicycling, and public transport. In Carfree Design Manual J.H. Crawford considers how to meld carfree planning with innovative design methods to achieve great improvements in the quality of urban design. The goal is to make carfree cities so irresistibly attractive that people will clamor for them. 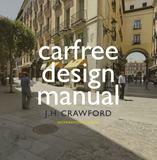 Carfree Design Manual makes city design accessible to everyone. The design of local streets will be determined by the people who will use them. The resulting places will fit the needs and desires of the residents. Once cars are removed from city streets, a great deal of design flexibility arises. In particular, streets can be much narrower than today. Without cars, we are free to arrange the intimate, small-scale neighborhoods that people seem to prefer. Part I considers theoretical issues in carfree city planning and design. Practice through the ages is reviewed and the influence of values is considered. Methods of analysis are discussed. Density issues are considered and illustrated. Part II examines the urban planning processes that must be completed before design can actually begin. The influence of planning on design is considered at length. The social advantages of urban villages are discussed. Part III presents a richly-illustrated palette of the urban elements that make up a pleasing whole. Streets, squares, buildings, and other elements are examined in detail. Part IV turns to the actual design of a carfree district. Innovative, direct, and simple methods are proposed to allocate building sites and to engage the future residents in the design of their new neighborhood. The methods are based on the creation of urban villages, which offer a rich social life to their members. The completed neighborhoods would reflect the needs, desires, and hopes of their residents. The process should yield complex, beautiful neighborhoods that will endure because people cherish them.